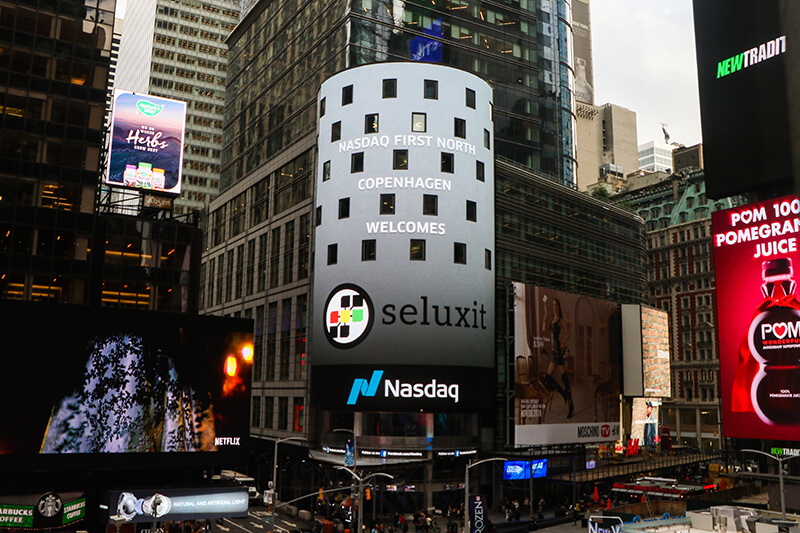 Friday the 9th of November at 9:00, the Nasdaq Copenhagen opening bell was rung at Seluxit's office in Aalborg, marking the first day of trade of Seluxit stock. The party — replete with champagne, cake and confetti — was attended by an enthusiastic group of investors and friends and was covered by local news, TV2 Nord in an article and accompanying TV spot (in Danish). See also this article from the Aalborg local newspaper, Nordjyske (in Danish). Below is an image from Nasdaq headquarters at Four Times Square, New York, where Seluxit was welcomed on the big screen. Seluxit stock, with the short name SLXIT, can be followed on the Nasdaq website.